On the outer end of the Maria Hilfer Straße, Vienna′s primary shopping lane, you will find the Technische Museum or Technical Museum with the predictable array of engineering, industrial and other technical items on display. 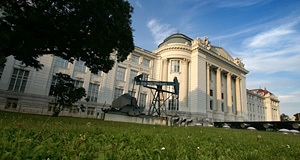 One focus of the exhibition lies on the Austrian contribution to technical innovations. Since these are not too many, the Technisches Museum is more popular with domestic visitors than with international tourists, but you still might want to go if it meets a specialist interest of yours. The crowds, however, are drawn to the Schloss Schönbrunn Imperial Palace that is only a few hundred metres away. People with an interest in architecture will find the building in which the Technical Museum is situated remarkable: Glass cupolas cover the inner courtyards and increase the exhibition space. Upon the occasion of Emperor Franz Joseph I′s 60th jubilee in 1908, the monarch decided to found a new museum dedicated to technology, industries and corporate life. The construction of the building, which was co-funded by major entrepreneurs from Vienna, started in 1909. However, partly due to the outbreak of WWI, the opening did not happen until 1918. After the construction of the Postsparkasse by Otto Wagner, the museum is one of the first significant buildings made from steel and concrete in Austria. Until 1922, it was run by a society, after that it as taken over by the republic and became a public entity. Between 1992 and 1999, the building was extended and drastically refurbished in order to modernise it. The Technisches Museum is a educational museum - this means, that it aims to communicate technical principles and its collection follows a "learning by doing" approach. Beyond that, there are also many historical technologies and devices on display. However, even with these historical items, the exhibition aims to teach people how things work. This applies for example to the locomotives and railway systems that were in use at the Erzberg mining industries in Styria. The car section portrays the little known car industry of Austria - surprisingly, one of the biggest industries in the country. The exhibition contains some of the oldest cars in the country, including the first Benz of Austria from 1892 and one of the oldest cars in the World from 1888. An artificial mine underneath the museum gives an introduction to one of Austria′s most crucial industries - the production of iron, silver and salt fuelled the expansion of the Habsburg′s empire for centuries. In the last couple of years, public funding was made increasingly dependent on own fundraising by the museum. In order to gain economic confidence, club nights and product presentations were held in the building. Changing exhibitions were aggressively advertised in order to boost the number of visitors. At the same time, criticism arose since the museum neglected its conservation duties - several locomotives and other items that are on display outdoors have suffered rust damages and require repairs. In an attempt to save these items, a group of Austrian industrialists has started a fundraising campaign to build a new exhibition hall.